This morning's red post collection includes a champion insights article for Taric's update, a reminder that the rotating game mode queue starts Friday with Ascension & a schedule of upcoming modes, Meddler on potential Grievous Wounds changes, a new episode of the League Community Podcast, and more! Red Post Collection: Taric Update Discussion & New Lore, Player Behavior Penalties & Hextech Crafting, and more! 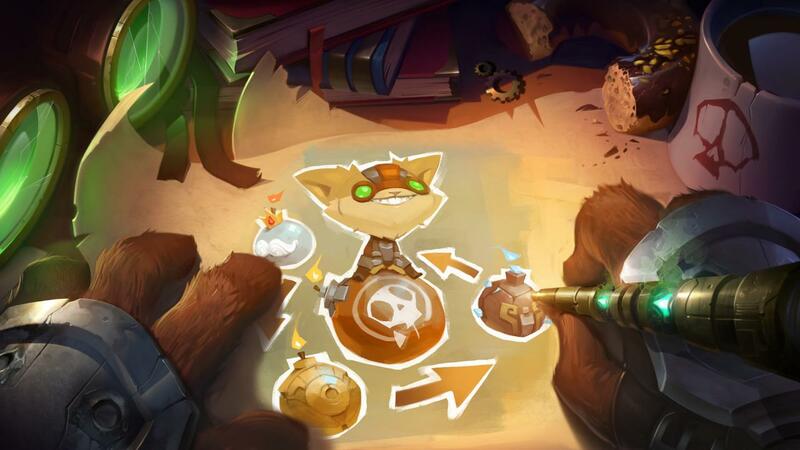 Red Post Collection: State of the Season, [PBE/6.9] Mana, Mp5, AP, & MR Item Pass,and more! Rotating Game Mode Queue live with Ascension + Schedule ! Splashes: Unifying, Updating, and You! 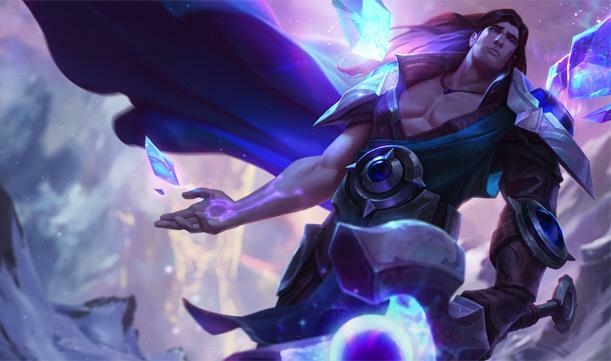 First up we have a champion insights article on the recently revealed Taric Champion update, detailing transformation from pizza feet to the Shield of Valoran! "As we've tuned the visuals on Taric's co-stars, the crystal-coated, pizza-footed Demacian has begun to feel like an eyesore by comparison. Couple his outrageous visuals with an outdated kit, and we had a prime candidate for a rework—but our goal wasn't to completely replace him. Instead, we sent the Gem Knight on an epic journey to transform him into the Shield of Valoran. When we originally created Taric, we came up with this pretty vague backstory about him being a space alien obsessed with gems. As a result, most players had the impression that he was just a weird dude who's always moaning about gems. The challenge was to write a story that could turn Taric into a believable character with a purpose and a justifiable explanation of his obsession with geology. We began by looking for a place for Taric to live that fit him thematically. He's supposedly a Demacian, but nothing about his gameplay or pointy wardrobe particularly fit that region's theme. 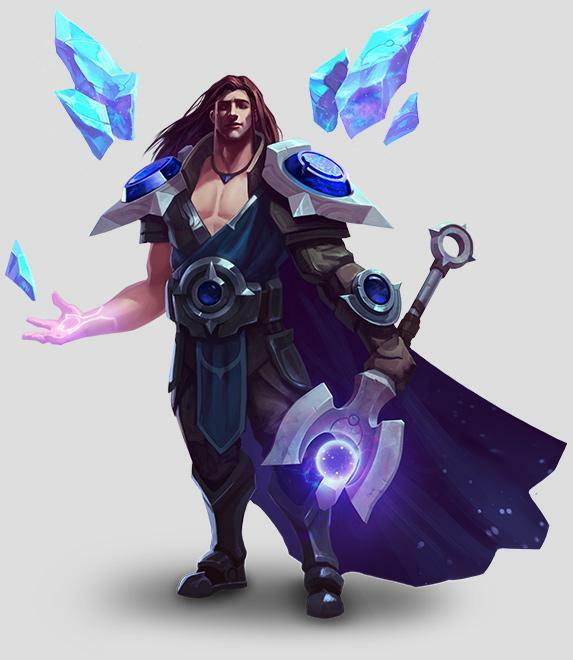 Our first impulse was to do away with that aspect of his story and reinvent him from scratch, but we had a better idea: what if we made the old Taric better by giving him a second act? We began writing a draft for "chapter two" in the tale of the Gem Knight: one which would send Taric on a perilous journey up the epic Mt. Targon. Upon reaching the summit, Taric fought and defeated a celestial entity known as "The Protector." The epic creature was impressed by Taric's determination, and it bestowed new protective powers upon the fallen Demacian. Thus the Gem Knight became Valoran’s Shield. 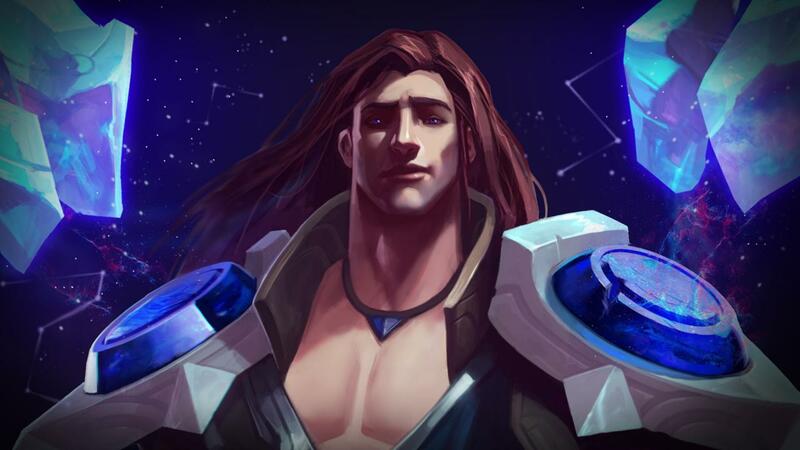 The newer, more glorious Taric is the same absurdly handsome Demacian you know and love. But his new story tells how he fell from grace, then found it again atop Mt. Targon. Taric's journey redefines him as someone who fights for beauty, who defends the delicate. He'd fight two armies at once to defend a flower (or two juggernauts at once to defend an Ezreal ADC, which is sort of the same thing). Taric's trip to the mountaintop gave him new purpose, but he needed more than that before he was ready for the Rift. He needed some fresh duds. Old Taric’s model is the most conspicuously heinous aspect of the champ; it's about 75 percent gems and crystals exploding out of every part of him. Frankly, it doesn’t look like it belongs in a video game from this decade. But his crystals don't have to look bad, nor should his epic, flowing, cover-of-a-romance-novel hair. We wanted to keep both of these things but execute them in a way that felt in tune with our current standards. Once we got Taric near Mt. Targon, we just needed to ask ourselves what his crystals actually are: Are they like regular gemstones that you could mine and find in the ground, or might they be something more interesting? 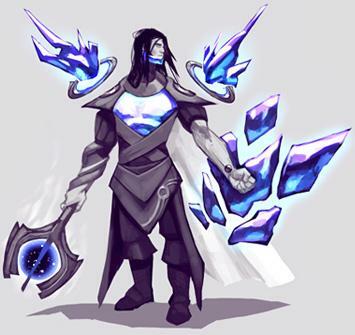 We landed on the idea that the crystals represent a power that Taric received during his journey up Mt. Targon. The crystals aren't stones; they're made of starlight. Throw away your physics textbook, unfollow Neil deGrasse Tyson on Twitter, and believe us when we tell you that if you slow down starlight and concentrate it, it will condense into a solid object imbued with strange, kinetic powers. 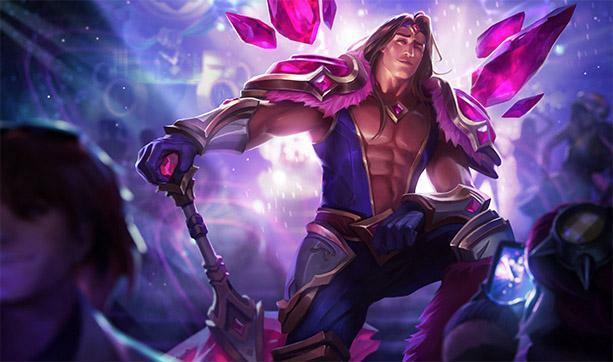 These crystals (or gems, if you will) are the source of Taric's newfound powers. To preserve Taric's unique vibe, we tuned up the over-the-top visual aspects of his visual design. When the Shield of Valoran struts around the Rift, his luscious mane flows wildly behind him, as if he’s constantly standing near a fan. It’s longer, wavier, more eye-catching. This is a man who could star in a shampoo commercial. And you'd buy that shampoo. 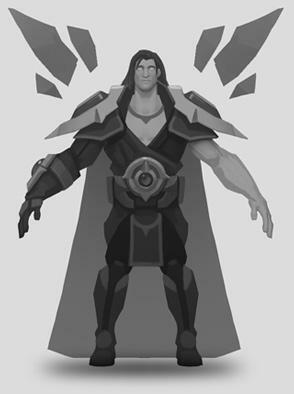 Emphasizing the best parts of Taric meant embracing and surgically enhancing his masculine, handsome beauty. We gave Taric's base model a stronger jaw and gave his jacket a plunging V-neck. 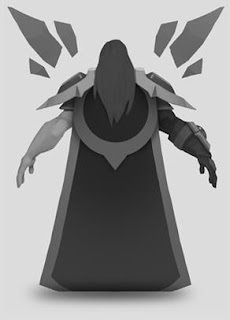 In early playtests, we had his V-neck going to the bottom of his pecs, but during internal testing a few Rioters gave the feedback that the V-neck needed to reveal more, to go deeper. They wanted all the Taric they could get. So deeper we went. Old Taric's kit wasn't obviously terrible, but it did suffer from one big problem: almost nothing he did felt or looked impactful. The Taric player pressed a button, and that caused something to happen, but the result was rarely clear to everyone in the fight. Playing as old Taric rarely offered you the chance to feel the sparkling glee of landing a Lux Q or the earth-shattering BOOM of a Malphite ult—the fun was all in quietly prolonging fights while shrugging off truly outrageous amounts of damage. His abilities were functional, but we needed to make them stylish. 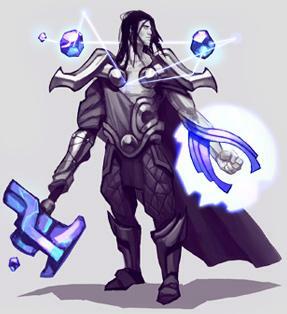 This was in part a visual clarity issue, but it was also a result of how widely dispersed and invisible Taric's abilities were—it mattered to the team as a whole when Taric gave 12 percent of his armor to his teammates, but those players were unlikely to notice the impact on their individual play and react accordingly. To make abilities feel more impactful, we make them more concentrated; so we killed some of his messy stat-boosting abilities and replaced them with noticeably flashier moves like his new ult, Cosmic Radiance, which grants his allies temporary invulnerability. You'll feel like a star when it hits. Point-and-click abilities have their place, but Taric's old stun was taking up far too much of his power budget. By turning his E (Dazzle) into a skillshot, we were able to ramp up its potential power (it now stuns all struck enemies instead of just one targeted baddie) in lieu of the lower guaranteed power of his old on-click ability. Talented Taric players will have more, clearer opportunities to make lock-down plays for their team, and bad Taric players will have more opportunities to disappoint you. Taric is still a tank, and he still heals his friends with his Q (Starlight's Touch), but the crystal-sharing mechanic of his new W (Bastion) further cements Taric's role as a protector of those in need. That the Shield of Valoran can only link up with one ally at a time would suggest that he's best when he focuses on helping only that champion, but this isn't the case; he can use his Bastion-buddy as a way to be two places at once, both stunning enemy backline carries and peeling for his own squishies as needed. He's here healing his Wukong, there peeling for his Lucian. Taric is everywhere, always protecting those in need. Taric has descended from Mt. Targon and is looking gorgeous on the PBE now. Expect to feel the protective embrace of his crystals soon." Itching for more on the Taric? Check out our PBE coverage of the Taric champion update for more on his abilities and updated skins! Read up on his new lore on the Mount Targon page! Rotating game mode queue live with Ascension! As previously mentioned in the 6.7 patch notes, the new Rotating Game Mode Queue kicks off this week with the return of the ASCENSION game mode! This mode will return from Friday afternoon and remain up through Monday morning! Following Ascension this week, next week will have Poro King, followed by URF and Hexakill: TT the weeks after! "From the original clone-tastic One For All to the frenetic manatee magic of Ultra Rapid Fire, featured game modes provide unique spins on the classic League formula. It’s time to kick things off with the first game mode in the rotation: Ascension is now live! If you’ve played Ascension before, you’ll probably notice we haven’t changed too much of the gameplay since the Shurima event. This won’t always be the case, but we found Ascension’s gameplay held up over time. We did touch up the visuals slightly while specially tuning Champion Mastery so you can earn points in the mode. You’ll also be able to earn keys for your wins and loot chests for your (or your premade’s) S­-, S, and S+ games. Ascension is now available and lasts through the evening on Sunday (we’ll shut it down very early Monday morning--usually between 1:00 AM and 3:00 AM). Up next after Ascension is Legend of the Poro King. 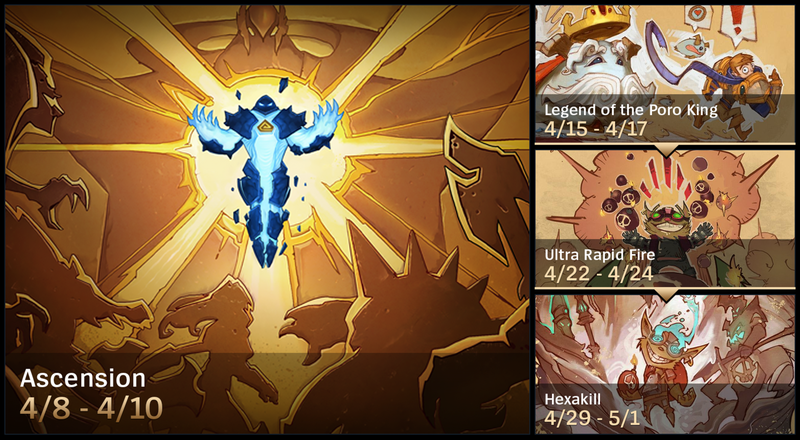 The splendiferous fluffy majesty of our poro overlord will descend on the rotating game mode queue next Friday, followed by Ultra Rapid Fire the next week, and Hexakill after. If you need to catch up on the rules for any game mode, check back at leagueoflegends.com each Friday, and we’ll give you the lowdown in a quick post like this one. We’ll be trying out different things with the rotating game mode queue over the next few months, such as potentially turning it on longer depending on how popular it is, changing the mode cadence or what modes are available. We’re looking for your feedback as we go, so let us know. GLHF, and we’ll see you on the sand-strewn battlefield of Ascension!" L4T3NCY confirmed on Reddit that while some details may change for the on/off numbers the actual schedule of game modes per week is global for all regions! -- The schedule for game modes is the same globally for all regions (IE: what mode is active each weekend). -- The exact ON/OFF timings might be slightly different in some regions, depending on their queue health. The goal is still Fri, Sat, Sun night as a start." Next up we have Ququroon with a post on the recent splash art changes, including more on the global splash art unification project and clarification on what those arts are vs what splash art you can expect to be updated in the near future. His post also includes previews of new base Warwick splash art and new splash art for Blade Mistress Morgana! As many have noticed, a lot of changes have been happening in this area over the last two patches, and even more changes further back. We haven’t done the best job of explaining what all these changes were, so let’s back up for a second and go in-depth on our rationale. To start, let’s clarify a term we’ve thrown around a bunch these days - Parity, the state of being equal. We typically use this term to describe the matching of an in-game model to the splash, though it also matters when referring to the parity between regions. We generally want good parity between a Champion’s assets, with some wiggle room for expression within the medium. Note that this is something we care significantly more about these days. With that out of the way, I’d like to describe all of the changes that you’re seeing, and why we’re doing them. (Normal) Splash Update: The updating of a splash (derr). In the past, we didn’t have the required people to update all of the skin splashes as we should when doing a Champion Update - creating situations where the splash would be dramatically different than what it represented (hello, Junkyard Trundle). The team felt this was unacceptable, and recently found a way to prevent this from happening again. (Backlog) Splash Update: This is us going back and fixing prior splashes that weren’t updated when a champion received an update of their own- a packaged update of skin splashes for previous Champion Updates (Nidalee, Trundle, Karma, Sion, etc.). We currently have Trundle, Nidalee, and Tristana at about ~80-90% finished (so look forward to that soon!). Global Splash Update/Unification: A one-time change (over two patches) that unifies all regions of League of Legends to have the same splash assets. Until recently, there was a vast number of inconsistencies of splashes between regions, meaning that somebody playing in China (or watching LPL!) might see something drastically different than what another player in EUW might see. Unify the representation of all characters to achieve global parity between splashes. A League of Legends champion shouldn’t be different solely due to where you are in the world. A consistent high quality splash should represent a character equally for all players. Fix internal development issues. In line with making our work more efficient, we often analyze areas of redundancy to get rid of problem areas. Each time we have a new splash created, it’s typically an unruly amount of work to determine if a region should obtain the new splash, keep their own, get it into their build, etc. This can lead to things such as Tencent getting their patches a week later, which isn’t fair for their players, and has rippling impacts onto the eSports scene. Stylistic quality- how much does the splash match the modern League of Legends style? There are a couple different styles over the various splashes (sup, Warrior Princess Sivir), and we draw a heavy preference towards League’s “rendered to hell and back” splashes. When making choices between art styles that didn't match on either end (Toxic Mundo is a great example), we erred towards ones that have higher artistic quality. Posing- how engaging is the champion’s pose? We like our splashes to have characters in dynamic poses suiting their narrative, rather than the ‘prom poses’ of the past. Global Appropriateness- A big thing for us is that all players are able to, well, play League of Legends. Increasing the rating in a region could cause a large amount of players to be unable to play. Yes, this does mean removing references to smoking for certain regions (such as Russia, and Turkey). This also means avoiding overly bloody or overly sexual images as well. This is not something done solely for Tencent- all players in all regions are the target here. Representation of the character- how accurately does the splash portray the character’s visuals and personality, both in and out of game? Once we locked a decision (which involves many different steps, such as talking with representatives in all regions, or getting the illustrators in a room to debate about the objective quality), we either checked in the unified splash, or performed a minor amount of cleanup if necessary. We will be continuing to update these splashes to meet our quality bar; prioritized by lack of quality, style (lookin’ at you, Vindicator Vayne), or inaccurate they may be. Bonus Splash Updates! : Special unique projects, usually spurred on by one need or another. In this upcoming case, we had a handful of splashes that were mostly done as passion projects, but weren’t quite finished. We’ll be shipping the first batch of these to PBE tomorrow, a couple of which had situations where we didn’t like any existing version from the Global Splash Unification (which would require an entirely new splash, rather than a paintover). These splashes, unlike the Unification, we are significantly happier with this quality bar, so these splashes are more or less final. 4.13: Amidst other splash updates to bases, we saw an opportunity to take the very best of the best of our international splashes. Solved the problem we’re solving with the Unification a slight bit, but there was still a long way to go. End of Season 4 Base Splashes: This was a heavy push to update as many of our out-of-date base splashes for Worlds that year. We made a great deal of progress, but not everything got finished at the time (coughcoughIreliaWarwickAnivia). Hopefully that clears some of this up. We haven’t been the clearest when it comes to splashes, but we’re hoping to turn that around. Thank you for helping us stay on track - and be sure to keep the feedback coming. PS. For making it all the way to the end, have another preview, on the house." Those new Warwick and Blade Mistress Morgana splashes look amazing!! Right? More splashes tomorrow with PBE, but I didn't want to spoil everything. :)"
A new episode of the League Community Podcast is out! Episode 16 invites on Magus and Shantzilla to discuss all things esports! 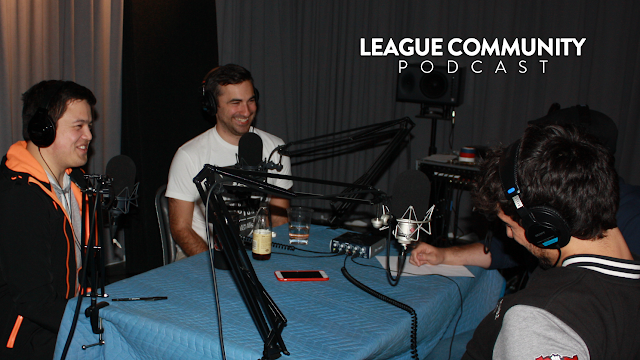 "Welcome to the latest installment of the League Community Podcast, a series in which we take you behind-the-scenes with the people who help make League possible. Expect new guests and new stories every couple of weeks or so, and make sure to hit us with those sweet comments and ratings so we can keep striving toward a Challenger tier podcast. This week, senior Riot esports figures Shanti “Shantzilla” Blees and Whalen “Magus” Rozelle drop by to share a bit about themselves and talk esports." "Right now we're looking at whether we should revert Grievous Wounds to its old functionality as part of the mid-season patch. Our original hope was that making healing output more consistent for extremely healing focused champions would make them easier to balance. That hasn't worked as well as desired however. As a result we're testing going back to GW affecting all healing to restore the partial safety valve that old GW gave when champs that heal others got out of line." What happened to the old 'get rid of Grevious Wounds altogether' idea? It's a really binary mechanic that is completely necessary against some champs and completely useless against others. GW as a safety valve is something we're still interested in. Generally there's something you can do to specifically improve your effectiveness when a specific enemy champion is doing really well. Against a melee auto attacker for example Frozen Heart's disproportionately valuable, Banshee's is especially strong against single CC focused champs like Blitz or Annie, Mikael's is great against Morg or Ashe etc. Grevious Wounds offers such an effect against champions whose power increases in self or ally focused ways (e.g. the unkillable Mundo or, if going back to an all healing model, the constantly topping people off Soraka)." Would reverting to old Grevous wounds and make Mortal Reminder have an active that applies grievous wounds to auto attacks for the next 5 seconds do the trick?. The hit target has Grievous Wounds applies for 3 seconds after being hit. Active has a 60 second Cooldown. That will keep the item in check from making soraka and the like useless but still allow for it to be effective when it is used well. We might need to adjust Executioner's Calling/Mortal Reminder yeah. It's possible going back to broader GW effect would require some more gating of how easily it can be applied for AD champs." Last up we have Reav3 with discussion on champion updates! "That's currently the plan, yes. Ryze, Yorick, and 1 more. It's ambitious though, but still very plausible. :)"
"It will be a VGU, so new model, VO, animations and gameplay. Similar in scope to the Tristana VGU and the Gangplank VGU, rather then the Taric/Poppy VGU's. Yes, we updated his gameplay last year but we didn't quite hit the mark we wanted to. When doing a full VGU with art changes you can push design much further." "The goal is to make him less mechanically intensive, yes. But we still want to add a lot of depth to his kit. Similar to the new Taric kit where it isn't super mechanically intensive but knowing when and where to use your abilities requires skill to master. In fact RiotRepertoir is doing the Ryze VGU, the same designer that did Taric." "Yeah Eve is pretty high on the full VGU list for next year." "Akali is already in the list for a full VGU, she just isn't as high priority as some other champions at the moment." "I think both Akali and Talon would be prime candidates for a Roster update when we get to Assassins. Just because a champion could use a VGU doesn't mean they couldn't get a small roster update in the meantime. Swain is getting some small, non art changes, for the mage update, for example. Swain is higher on the list then Akali is though so actually putting a bunch of art resources into him right now for the mage update didn't feel worth it." So will there be an assassin update? Somewhere this year? We will do another roster update for pre-season. We haven't decided what class it will be yet though. It's between Assassins, Divers & Tanks. So it's a possibility that there will be a assassin update this year." This is a ballsy question but its worth the shot. Could u give any "spoiler" about the assassin update? Specificly talon, like the abilities that are being planned on updating? We haven't started on anything yet so there is nothing planned. The roster designers are hard at work finishing up the Mages for the very quickly approaching Mid Season patch." To build on what Ququroon noted above, Reav3 also noted that Sion should be next for brand new skin splash arts following the previously mentioned Nidalee, Tristana, and Trundle. "Sion should be next after Nid/Trist/Trundle. It might be a little ways off since some of the current VGUs we have planned, like Ryze for example, have a lot of skins!" "If all goes well you should start to see some of these roll out over the next couple patches."